It’s not often that supporters of reproductive rights get a piece of good news. Though, what can be described as good news these days is part of the bad news. On July 28, an Alabama magistrate judge ruled in favor of the ACLU and struck down portions of HB494, the state’s 2014 law that, among other things, put minors seeking abortions on trial and even provided lawyers — for the fetuses. Alabama is one of thirty-seven states that require parental involvement in a minor’s decision to receive abortion care. Specifically, Alabama requires the consent of one parent at least forty-eight hours in advance of the procedure but, like the vast majority of states with parental involvement laws, it also includes what is known as a “judicial bypass.” This alternate route exists for all the reasons a teenager may be unable to obtain parental consent. But, HB494 tightened restrictions around the judicial bypass and gave the state the right to call witnesses — friends, boyfriends, teachers, neighbors, family members, up to and including parents — to testify as to whether the minor was “mature enough” to make the decision to have an abortion. This, in addition to providing a guardian ad litem in order to protect the “best interests” of the fetus. This recent case is but one illuminating snapshot of the state of abortion rights in the United States today. The broader picture — a detailed examination of which can be found in the webpages of the Guttmacher Institute — will have to be summarized: “Since 2010, the US abortion landscape has grown increasingly restrictive as more states become hostile to abortion rights. Between 2010 and 2016, states enacted 338 new abortion restrictions, which account for nearly 30 percent of the 1,142 abortion restrictions enacted by states since the 1973 Supreme Court decision in Roe v. Wade.” Even this doesn’t capture the nearly two hundred abortion providers that have closed their doors since 2011. Let alone the countless other stories just as horrifying, or worse, as that of the anonymous twelve-year-old girl from Alabama. Thus, the strategy employed by the antis of going after abortion rights incrementally, restriction by restriction and state by state, has been as deliberate as it is successful. There is really no way to overstate just how dire the situation is. This isn’t so much about the prospect of Roe being overturned — the perennial fear that drives many Democratic voters to the polls — it’s about the fact that for millions of women in thousands of zip codes across the country it feels like it already has been. Luján’s remarks seem to make official the increasingly apparent trend within the party to open its doors to anti-abortion candidates and de-prioritize at this historically vulnerable moment what many consider to be a staple of Democratic Party politics, even if nominally so. 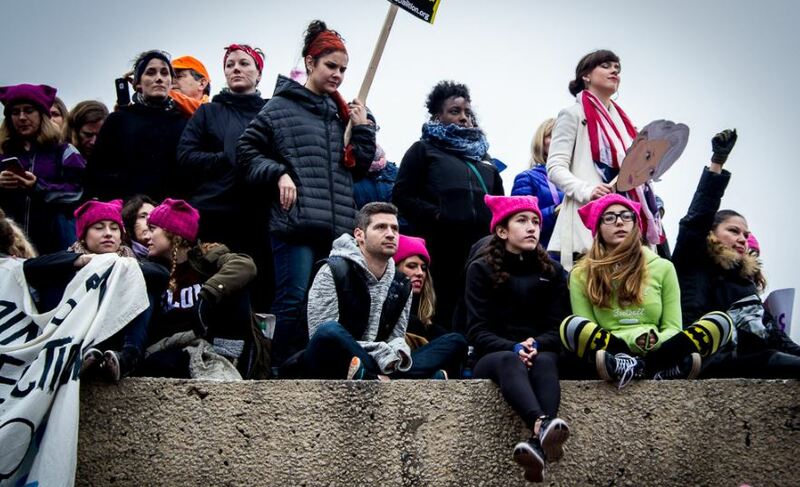 This, despite the fact that millions of people across the country who make up the base of the Democratic Party came out for the Women’s March to protest Trump’s election and his specific attacks on women during his campaign. But the argument to welcome anti-choice Democrats into the party has also come from Bernie Sanders, who put all his support behind Omaha’s openly “pro-life” mayoral candidate Heath Mello. This was less expected and far more disappointing for the obvious reason that Sanders’s primary campaign activated the youngest and most left-wing elements of the party and injected a deeply felt optimism about what could be fought for based on a solidly social-democratic platform. Unfortunately, a critical examination of the reasons for Sanders’s support for Mello and generally ill-considered position on the crucial question of abortion rights — or its potential impact — was quickly hijacked by Clinton supporters still bitter about her loss and eager to defame Sanders and his mythical “Bernie Bro” supporters. One of the worst but certainly not the only offenders was liberal writer Jill Filipovic whose seething anger against “some men” in the Democratic Party and “the self-proclaimed socialist left” seemed to be little more than an excuse to attack Sanders supporters while ignoring Clinton’s VP pick of Tim “Abstinence Only” Kaine and even defending her infamous “safe, legal, and rare” formulation as something remotely progressive. Planned Parenthood Voters of Nebraska only scores votes on passed legislation. In 2011, PPVN’s scorecard shows Heath Mello voting against Planned Parenthood’s position on three votes — all abortion related. In 2015, PPVN scored two votes in the Nebraska legislature, which were Medicaid and family planning related. PPVN’s scorecard shows Heath Mello voting in favor of the Planned Parenthood position. To be clear, that does not translate into a 100% rating or an endorsement. The Left, it should be obvious, has absolutely no reason to defend this shameful record and should frankly recoil at the suggestion. Especially considering the context of Nebraska, one of the worst offenders with regards to abortion rights, where a court refused the request of a sixteen-year-old girl to obtain an abortion in 2013. This wasn’t at all uncommon except for the fact that she appealed the decision and made national headlines — only to be denied again. Moreover, what got lost in the melee of the debate was Sanders’s rationale for supporting Mello. For Sanders this clearly wasn’t about Mello’s nonexistent evolution on the question of abortion rights. It is an explicitly strategic calculation and the Left should unequivocally oppose that strategy. The fact that, instead, many stumbled over themselves to try to make Sanders’s move to the right on this question more palatable is an ominous illustration of how a narrow focus on elections can cause us to lose sight of our long-term goals. That statement should be a starting point for left strategy today — and it is completely at odds, it’s worth noting, with Sanders’s rationale for supporting Mello, who eventually lost. In fact, the strategy of opening the doors to anti-choice Democrats in order to “fit the district” is actually rooted in a profoundly elitist notion that people in certain parts of the country couldn’t be swayed by left-wing arguments around abortion — despite the fact that women all over the country and from all religious backgrounds need and try to get them. Disguised as “pragmatism” it is actually a significant part of the reason — in addition to a retreat from grassroots activism — that abortion access is so dismal today. As an example, in 1986 Arkansas voters nearly passed an amendment to their state’s constitution that would have banned abortion subsidies in the state, despite the fact that Arkansas wasn’t providing abortion subsidies and the Hyde Amendment prevented federal subsidies as well. While Amendment 65 didn’t pass, the strategy to defeat the amendment concocted by Democratic consultants, funded by groups like NOW and the ACLU, highlight the problems with the narrow electoral strategy. These consultants argued that Arkansas voters would be completely immune to arguments about women’s rights, so they should be avoided at all cost. In fact, they argued to stay away entirely from the words “women” or “rights.” They would win skeptical, right-leaning voters on the basis of government intrusion on private, family decisions. For these voters, government intrusion meant taking away their guns or telling them who to live next to (read: black people). These racist right-wingers were the voters that would guide the strategy of the consultants. And this wasn’t a one-off. The Arkansas victory was seen as the model for “keeping Roe” going forward. This was a conscious decision to shift towards an electoral strategy aimed at disassociating abortion rights from its emancipatory origins in the women’s movement. And it meant compromise after compromise on all kinds of questions that should have been non-negotiable. [R]ather than treat elections as a means to winning legislative fights, NARAL would treat legislative fights as a means to winning elections. It would focus on campaigns rather than government, as [one strategist] had put it in his creed of political consulting. “Our decision to become involved in defensive legislative efforts should be dictated by our political and electoral objectives,” [another consultant] wrote. On this principle, NARAL might support bills crafted to “give our friends ‘cover’ on issues such as parental consent.” Better to pass a diluted parental involvement bill than to jeopardize the careers of pro-choice lawmakers by forcing them to oppose the idea altogether. Hindsight should tell us that the Left’s strategy must distinguish itself from Democratic electoral strategy. What the Left needs to do on the ideological front is to put forward a clear, uncompromising, and unapologetic defense of abortion rights. An excellent example of how to do so is provided by Dr Willie Parker, whose recent book, Life’s Work: A Moral Argument for Choice, is required reading for all those wishing to advance the struggle for reproductive rights. Parker makes it clear that if a woman cannot be trusted to make decisions about her reproduction, she has no control over her life and future. While Democrats — and organizations who support and even provide abortion care — have continuously ceded ground to the notion that there is something morally objectionable about abortions or abortion care, the Left needs to argue that what is truly immoral and cruel is forcing women, trans men, and girls to stay pregnant even a moment longer than they want to be or, worse, forcing them to carry an unwanted pregnancy to term. Any argument to the contrary amounts to the policing of and punishment for a person’s sexual activity — a violation of one’s bodily autonomy. The picture is grim and the stakes are high. But we can take solace in the fact that a majority of the country still supports the constitutional right to an abortion — an excellent basis for further argumentation and education on the question. And the fact that 62 percent of Americans think it is the responsibility of the federal government to guarantee health care for all is further reason for optimism. These are openings that reproductive rights activists should be pursuing and attempting to expand on.